My dogs always gets super excited to review any type of products. I swear they know if something is for them. Jaxen and Ava were recently sent some treats and wet dog food to try from Healthy Elements. When I received the package, both dogs were running around like crazy and would do anything for the treats. I got some super funny pictures of them being silly (see below). The dogs were sent a couple bags of treats from the Soft and Moist Dog Treats line. I gave them the salmon and apple flavor which they loved. When my brother's puppy came over, I opened up the bag of the crunchy lamb and apples snacks which they enjoyed as well. These products contain no meat byproducts, fillers, wheat or artificial colors or preservatives. They use real, wholesome ingredients such as oats, lamb, carrots, sweet potato and flaxseed. I love that these treats use real ingredients. I find it important what I put into my body and find it important to make sure that the dogs are getting real foods as well. Healthy Elements dog treats are approved by these dachshunds! 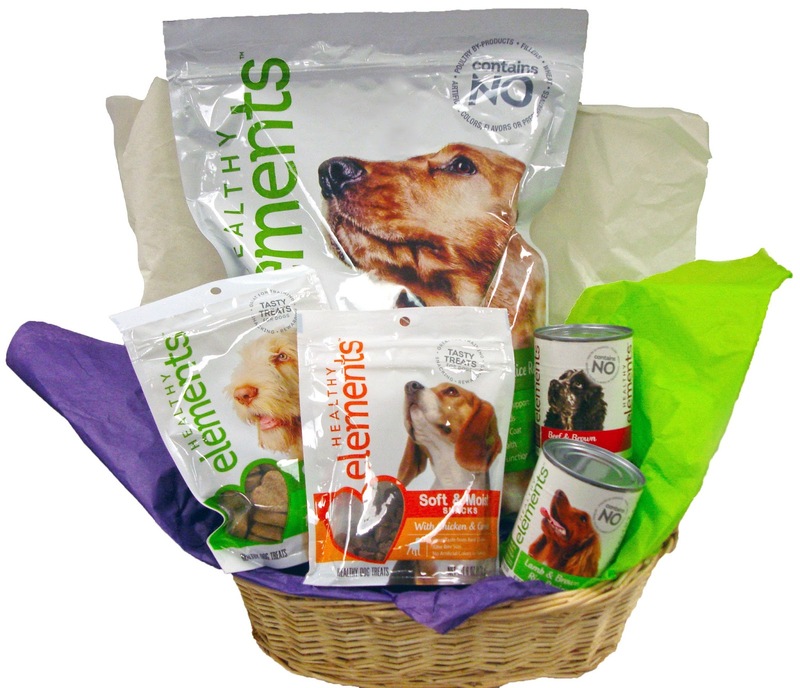 The giveaway will be for this Healthy Elements gift basket to one lucky reader. That is awesome that you have 3..sorry that the one is sick. My dogs always have some kind of health scare going on. I love them though! Love the pictures of your dachshunds! Aren't they the best? I have one as well and she's about 16 years old and has more lives than a cat! I love her to death though! That is so wonderful that your doxie is 16!! It gives me so much hope that mine will live at least that long (they better- I don't know what I would do without them). I had to go get everyone in the house to look at your dogs. They really are adorable & so photogenic. You can definitely tell they are well taken care of, especially nutrition wise. I'm glad you are promoting healthier eating for dogs. A lot of people out there don't think twice about it! I just got a puppy three month ago she so cute. she I all black with dark blue eyes so I call her midnight. your dogs are so cute. I try hard to feed my puppy healthy snacks and food.